Welcoming our new Wellbeing Services Manager! Last month we had the pleasure of welcoming our new Services Manager (Wellbeing), Julie to the Pharmacist Support team. Julie will work alongside fellow Services Manager Paulette Storey and together they will be responsible for the management, development and delivery of the Charity’s services. Julie will oversee our wellbeing and financial assistance services as well as the management, development and support of Charity volunteers. 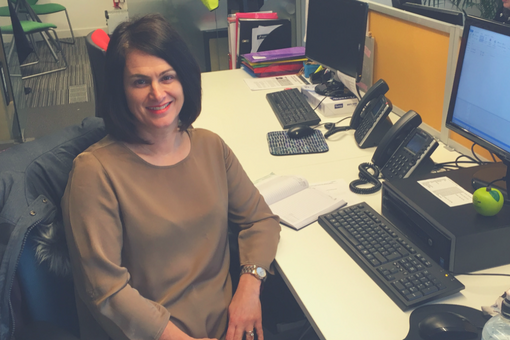 We took some time to have a chat with Julie to see how she’s been settling in. I have largely worked in charitable organisations supporting parents, children and families in a variety of services for more than 25 years and have had management roles for the last 14 of those. My work has always been with people who are vulnerable and facing difficult issues, situations and circumstances and identifying and offering appropriate support to help them to make necessary changes. The services I have worked for include family centres, young carers and their families, children’s rights and advocacy, children’s centres, relationship programmes and most recently supporting statutory Children in Need and their families. And in amongst that two very brief periods as a statutory social worker! I live in a small town in East Cheshire with my husband and 11 year old daughter. I have lived there for most of my life and have family nearby and friends that I went to school with who now have families of their own. So outside of work I like to keep in touch with them and do all the usual things people say in response to that question………… going to the cinema, away on holiday, out for meals, bike rides, walking – I’m a simple but sociable soul! What was it that attracted you to this post? I thought the Wellbeing Services Manager role was a familiar job to me in relation to managing services but was attracted to working in a different area. I really liked the idea of this and learning something new – working to support Pharmacists and finding out about Pharmacy. I also enjoy working for charitable organisations. I’m pleased to be joining PS and taking on new challenges in a new area of work. I’m looking forward to using my skills, knowledge and experience to support the great work that is already being done, to getting involved in developing new ideas and of course working with a great team.